Did you know that 97% of buyers believe one-stop shopping makes the homebuying process easier? 88% of homebuyers who worked with our mortgage, title or insurance companies would recommend our services to others. Why? Howard Hanna offers a real estate experience that is truly unique. Let us walk you through the entire homebuying process from start to finish. 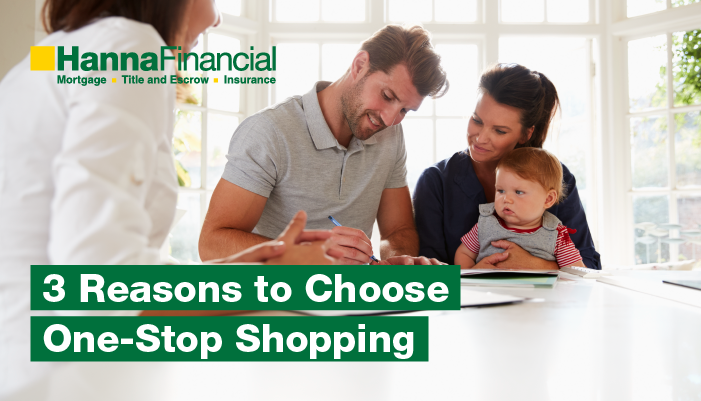 Here are three reasons why you should choose the ease of Howard Hanna’s One-Stop Shopping Experience. The convenience of one-stop shopping with your affiliated mortgage, title, and insurance agency is obvious. Purchasing a home (especially for the first time) is a complicated process with a lot of services and requirements that are thrust upon the buyers. If the mortgage, title insurance, and other settlement services can be procured through the real estate agent (someone the buyers trust and feel comfortable with), this will save the buyer the hassle of shopping around and trying to make sense of a service they are not familiar with. HannaFinancial provides greater accountability because all of the entities are owned or partially owned by Howard Hanna Real Estate Services. If an affiliated mortgage, title or insurance agency does not provide competitive pricing and services, then that will reflect poorly on the agent and will, in turn, be harmful to future business. Affiliated agencies also have the ability to communicate with the agent, their managers, and other Howard Hanna departments through integrated technology platforms, which allows for speedier transactions. Real estate, mortgage, title, and insurance. Howard Hanna has it all. 90% of homebuyers who didn’t use one-stop shopping wish they had. Don’t be one of those people! We’re confident you’ll find the Howard Hanna One-Stop Shopping Experience a better way to buy a home. At Howard Hanna, we believe it’s more than a transaction – it’s our commitment to finding you the perfect home, and financing that suits your needs. We’re excited to serve you!